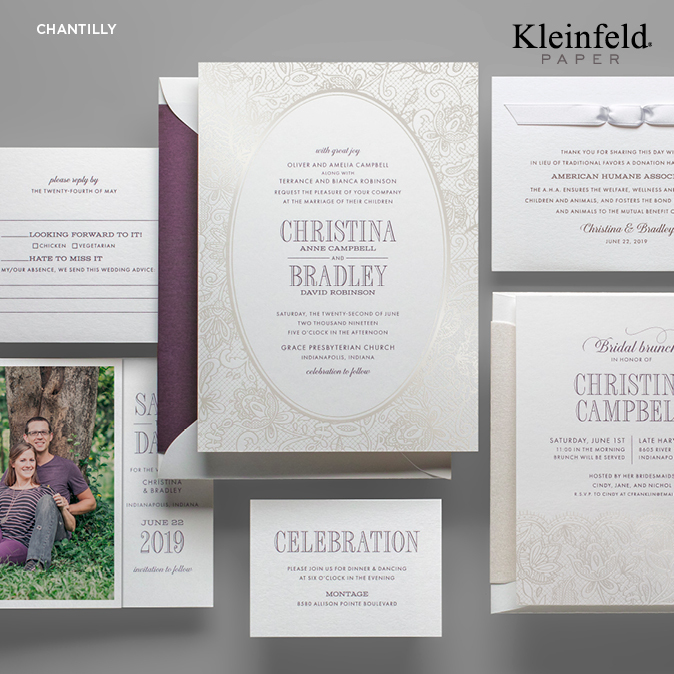 Description: Kleinfeld Paper is a partnership with Kleinfeld Bridal, bringing the same beautiful invitations as their incomparable selection of bridal gowns. These classic, yet fresh designs are made with only the best papers, printing technologies, (including engraving, letterpress, digital and raised print) and unique folders, sizes and shapes. Also available are accessories such as layers, pockets, die cut shapes, gatefolds, bellybands, envelope liners and hundreds of monograms and motifs. Guest addressing is also available. These invitations, Save the Dates, and all other pieces of the wedding suite are completely customizable and absolutely stunning. Pricing: Prices vary depending on paper and ink choices. Please inquire or make an appointment to see samples.